The Feast of Tabernacles had ended. The crowds had dispersed and those who had traveled to Jerusalem from the outlying regions were making their way home. 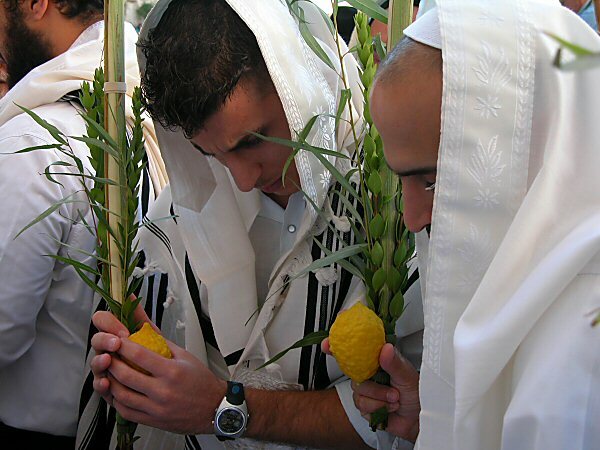 The sukkahs were being cleared away along with well-shaken lulavs, bent and broken from the joyous celebration. Jerusalem was returning to its usual bustling pace. People were still talking about the spectacular light that had shone from the Temple and cast a glow upon the whole city. However, it was difficult for the man who sat by the entrance to the Temple courtyard to understand these conversations. He had never beheld the giant candelabra shining into the night. And although he had felt its warmth and heard it crackle, he had never even seen fire. For this man had been born blind. “I was blind when the festival began and now it’s over, and I am blind still,” he thought. “And so it shall probably be until the end of my days; I shall sit here, begging for a few measly coins always.” He nodded in the direction of the sound of someone walking into the Temple. “The Lord bless you,” he said to the wind. Later that day, he heard a group of people approaching. The group paused before him and the blind man heard one of them ask, “Rabbi, who sinned, this man, or his parents, that he should be born blind?” The beggar steeled himself for the answer to come. He didn’t think he could bear it if the rabbi were to say something about his parents, whom he loved and who had always shown him compassion, even though they must have been disappointed that their child was…well, broken. As these thoughts went through his mind, he heard the rabbi reply, “It was neither that this man sinned, nor his parents; but it was so that the works of God might be displayed in him.” The beggar was astonished and then he had another thought, but he was too afraid to speak it: “This must be the man called Jesus.” He had heard rumors and rumblings about Jesus for weeks. People spoke freely about him in front of the beggar, for they must have assumed that just because he couldn’t see, there must be something wrong with his hearing. So the blind man had heard plenty. Some had called Jesus a lunatic or a liar, but many were saying that he was the Prophet who was to come, that he was the Messiah, the Anointed One. Since the time of Adam and Eve’s drastic choice in the Garden of Eden, humanity experienced exile from God’s immediate and intimate presence. And then God called Abraham, and promised to make his descendants into a great nation, a nation through whom all other nations would be blessed (Genesis 12). The patriarchs of our faith lived as nomads,2 dwelling in temporary shelters (sukkot), looking ahead to the time when God would provide a land for them and restore them to paradise, just as he had promised. Likewise, their successors, upon exodus from slavery in Egypt, lived in sukkot during forty years of wandering in the wilderness. Though they dwelt in these flimsy shelters for forty years, God provided constant reminders of his watchcare: the pillar of cloud by day and the pillar of fire by night signified his presence with his people. God also made a holy place for himself in the midst of the people: the tabernacle, a place where the Israelites could be reconciled to him through sacrifices. Yes, we wandered for forty years—but we did not wander alone. Those living at the time of Jesus recognized the prophetic significance of Sukkot and so the ceremonies celebrated in those days had prophetic implications. One of the greatest of these rituals was the illumination of the Temple. Over the years, the Temple became central to Sukkot. In fact, King Solomon chose the Feast of Tabernacles as the time to dedicate the first Temple. As the people celebrated, God’s shekinah glory filled the Temple. God showed his goodness and mercy by coming once again to dwell in the midst of his people, just as he had in the wilderness. Years later, however, the ark of the covenant was captured and the glory of the Lord departed from the Temple. Yet the Temple remained the focus of the feast through splendid ceremonies such as the illumination rite. According to the Mishnah, four 75-foot candelabra stood within the court of the women. Each candelabrum had four branches, and at the top of every branch was a huge bowl. Four young men bearing tengallon pitchers of oil would climb ladders to fill the golden bowls and set them alight. Picture sixteen beautiful blazes leaping toward the sky from those enormous golden lamps. Note that the Temple was on a hill, so the glorious glow was a sight for the entire city to see. The light was to remind the people of how God’s shekinah glory had once filled his Temple. And it looked forward to a time when that glory would return. It was believed that in the time of the Messiah all nations would worship God, in accordance with the prophecy in Zechariah and the promise God made to Abraham, that in him all nations of the earth would be blessed. The Jewish people in Jesus’ time were expecting this day with great anticipation. With the illumination of the Temple, they rejoiced over greater light that was to come. Light has always been a sign of God’s revelation and his presence. From the burning bush that Moses encountered to the pillar of fire that the Israelites followed, to the shekinah glory that once rested in the Temple, the presence of light has long been equated with the presence of God. The light was meant to symbolize the presence of God. That day in the Temple, Jesus said that he was the presence of God, right there, in their midst. At the same time, he was declaring that he was the Messiah. He was the Light that the people had been waiting for. Because he anointed me to preach [good news] to the poor. The meaning of Jesus’ words and deeds was certainly not lost on the people. Some chose to accept what he said and believed he was the Messiah, and some chose to reject him, asking, “What kind of Messiah could come from Galilee?” Apparently, they chose to ignore the Isaiah prophecy mentioned above—for where does it say the Messiah, the light of the world, would come from? There are different types of blindness. There is a physical blindness that longs for physical light and there is another kind of blindness wherein a person shuts his or her eyes to things that they do not want to believe. If you look at the accounts of Jesus’ life and death, you’ll see that he came to take care of both kinds of blindness. The religious leadership of Jesus’ day refused to believe in the Sukkot miracle. What the religious leadership had missed, a blind beggar found. “His day of ingathering had dawned.”6 For him, the joy of the Feast of Tabernacles was a personal reality, for he had been in the presence of the light of the world. 2.”Jacob journeyed to Succoth, and built for himself a house and made booths for his livestock; therefore the place is named Succoth” (Genesis 33:17). 3. Edersheim, Alfred. The Life and Times of Jesus the Messiah. Grand Rapids, Eerdmans, 1976, p. 149.